Do You Know Why Fannie Mae Is #1 in the World? I don’t know if I am impressed or appalled by the fact that Fannie Mae and Freddie Mac are in the #1 and #3 positions in the world for the amount of money they make per employee. If the record was set by a private or public business, I would be impressed — as long as it is was done legitimately. But as a government-held enterprise? Maybe they are just so efficiently managed that they deserve to be in those top spots. Or do they have a monopoly and can charge and do whatever they want? Fannie and Freddie provide mortgages to help people achieve the American dream of homeownership. In light of that, one would think they could help to make it more affordable by charging less and make less per employee. Like I said, I don’t know if this is good or bad. If they are managing as efficiently as possible, then good for them. Maybe other government entities could take a page from their playbook. See what you think when you read the article below, and check the chart, too. 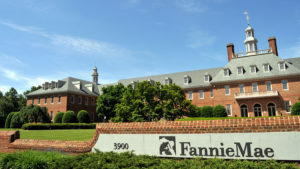 Is Fannie Mae’s first-place status deserved? What Fannie Mae and Freddie Mac do with the money they make has long been a debate in the housing finance world. Some argued that the government-sponsored enterprises should be allowed to retain all their profits, while others argued that the GSEs’ profits should continue to flow to the Department of the Treasury, as they have since the government took the companies into conservatorship. There was finally movement in that argument last week, when the Federal Housing Finance Agency announced that each of the GSEs will be allowed to keep some of their profits to cover against a potential draw from the Treasury amid the “normal course” of business. What has never been up for debate is just how much money the GSEs make. Being the major (only?) players in the secondary mortgage market has been good business for Fannie and Freddie for some time. But new analysis from Visual Capitalist (via Business Insider) puts the GSEs’ business into stark perspective. According to the report, Fannie and Freddie make more money per employee than almost every other company in the entire world. In fact, the GSEs take up two of the top three spots on the list of highest profit per employee among the most profitable companies on the Fortune Global 500 list. Fannie Mae takes the top spot, well above any other company in the world. According to the report, Fannie Mae makes $1.76 million per employee, more than $200,000 above the second place finisher – Gilead Sciences, a pharmaceutical company. Freddie checks in at #3, with a profit per employee of $1.31 million. Freddie’s profit per employee is more than double the fourth place company: Facebook – that tiny social network you may have heard of once or twice. Facebook makes just shy of $600,000 per employee. Other companies in the top 20: Apple, Alphabet, Goldman Sachs, SoftBank Group, and Microsoft.